First Line:"Ten seconds after Mrs. Cleo moseyed on into biology class, flipped on the projector and turned off the lights, Bambi decided she was no longer comfortable where she was currently curled around my waist." 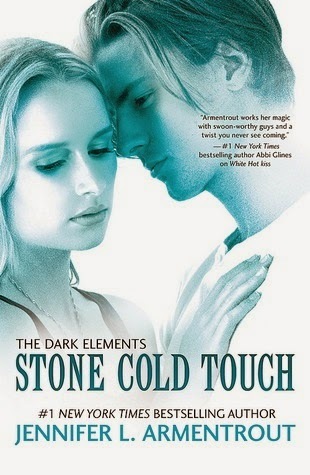 Review:Stone Cold Touch is the second book in Armentrout's The Dark Elements series and yes it was pure perfection like pretty much everything else she writes. There are two boys in this book and yes there are teams which usually annoys me but best believe it I voted...literally voted for Roth...how could you not after reading Stone Cold Touch. "Zayne would lock me in a room to keep me safe if he thought there was even a hint of danger in the air. Roth...yeah, he'd tried to get me out of the way, but he wouldn't shelter me." Roth lets Layla be who she really is, he doesn't try to cage her in and conform her and damn it it's ROTH! The plot was also very well done there was tons of action which kept things moving along at a very fast pace. Stone Cold Touch was everything I want in a book even with that pesky love triangle which is done perfectly. I am dying for the next book and crossing my fingers that majority voted for Roth. ~ "Love is a strange creature on thinks one has a grasp on and understanding of, only to discover later that it was only the barest taste of the real thing." ~"Roth brought you here for food? That's great. You look as comfortable as a kitten huddled in a pile of pit bulls."